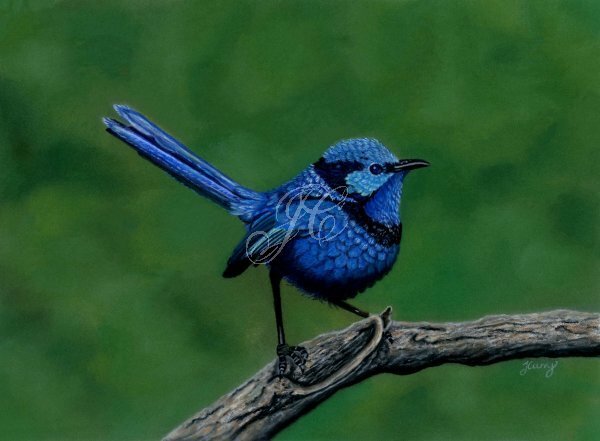 This is the sixth painting in my "Fairy Wrens of Australia" series. It features a male Splendid Fairy Wren perched on a branch. Splendid Fairy Wrens are commonly found in Arid and Semi-Arid regions of Australia, preferring shrublands and shrubby woodlands in areas of central-western New South Wales, southwestern Queensland over to coastal Western Australia. The breeding plumage of the male varies from cobalt-blue hue in the east of its range and violet-blue in the west. Artist quality Pastel Pencils and Panpastels (soft pastels) on Clairefontaine Pastelmat. Reference photo by Dreamstime. Size is 25 x 17.5 cm. Original Pastel Painting is framed and ready to hang and Fine Art Giclee prints are also available in a range of sizes. Splendidly Divine received a Highly Commended in the Pencil, Pen and Ink section at the Town of Murals Art Show in September 2018.